Directive 2004/49/EC on safety on the Community’s railways elaborates the provisions for the safety certificates of railway undertakings. Article 10 of this Directive states that in order to be granted access to a railway infrastructure, a railway undertaking must hold a safety certificate. The purpose of the safety certificate is to provide evidence that the railway undertaking has established its safety management system and can meet requirements laid down in Technical Specifications for Interoperability, established under Council Directive 96/48/EC of 23 July 1996 on the interoperability of the trans-European high-speed rail system (3), Directive 2001/16/EC of 19 March 2001 of the European Parliament and of the Council on the interoperability of the trans-European conventional rail system (4), and other Community legislation, and in national rules in order to control risks and operate safely on the network. Member States should make efforts to assist applicants wishing to enter the market as railway undertakings, and in particular they should provide information and act promptly for requests for safety certification. For railway undertakings operating international services it is important that the procedures for safety certification are similar in different Member States; therefore common parts of the safety certificate shall be harmonised in order to provide for a common template. To this end Article 15 of Directive 2004/49/EC provides for the harmonisation of safety certificates. Article 7 of Regulation (EC) No 881/2004 states that the Agency shall draft and recommend a harmonised format for safety certificates, including an electronic version, and a harmonised format for applications for safety certificates including a list of the essential details to be provided. In accordance with Article 33 of Directive 2004/49/EC, Member States shall bring into force its provisions by 30 April 2006. Hence from this date safety certificates shall be awarded in accordance with the provisions of Directive 2004/49/EC. This makes it necessary to take early action to harmonise the approach to safety certificates such that Member States may apply a harmonised approach as soon as possible. Article 10 of Directive 2004/49/EC makes provisions for the safety certificate to comprise of two parts: one part confirming acceptance of the railway undertaking’s safety management system which shall be accepted throughout the Community (Part A), and the second part confirming the provisions adopted to meet the specific national requirements necessary to operate on the relevant network (Part B). The harmonised safety certificate application and guidelines contained within this Regulation provide guidance for railway undertakings and national safety authorities on what should be contained within an application for each part of the safety certificate. In accordance with Article 10(6) of Directive 2004/49/EC national safety authorities shall inform the Agency of the safety certificates issued in accordance with the provisions of Article 10(2)(a) of the same Directive (Part A Certificates). However the Agency, in accordance with Article 11(1)(b) of its Regulation (EC) No 881/2004, shall keep a public database of all safety certificates issued in accordance with Article 10 of Directive 2004/49/EC. This obligation requires the Agency to publish both Part A and Part B Certificates. Therefore in support of Article 11(1)(b) of Regulation (EC) No 881/2004 Member States shall inform the Agency of Part B safety certificates granted under Article 10(2)(b) of Directive 2004/49/EC, as well as Part A certificates. National safety authorities may inform the Agency of the issue, renewal, amendment or revocation of safety certificates by three main methods: through the use of the Agency’s web based tool, by submitting an electronic file of the safety certificate, or by providing a facsimile of the safety certificate. To facilitate the use of the standard format and to guarantee the use of the latest version of the forms it is recommended that national safety authorities use the web based electronic format on the website of the Agency or download either the electronic file or the master documents provided on the same website. The use of the web based electronic version is highly recommended as it allows for saving the document directly into the Agency’s database. Submitting an electronic file is also recommended, as it enables the Agency to save the document as a codified file, which can be sent directly to the Agency’s safety database. Each safety certificate granted by the Member States shall be given a unique number; this number shall also facilitate the method by which the safety certificate is recorded in the public database to be established by the Agency. In order to avoid unnecessary financial and administrative burdens, it is necessary to clarify that railway undertakings having obtained a safety certificate in accordance with Directive 2001/14/EC of the European Parliament and of the Council of 26 February 2001 on the allocation of railway infrastructure capacity and the levying of charges for the use of railway infrastructure and safety certification (5) are not obliged to apply for a new safety certificate until 1st of January 2011. Existing safety certificates are valid as long as the conditions for their validity are met; as soon as one of the conditions is not met (such as, for example, expiry or change of geographical scope), a new safety certificate shall be requested. This should not preclude the case where a railway undertaking, which already holds a certificate granted under Directive 2001/14/EC, can request a certificate in the new harmonised format. This question has been brought to the attention of the Commission in the context of Article 28(1) of Directive 2004/49/EC. Safety certificates issued in accordance with Article 10(2)(a) of Directive 2004/49/EC (Part A Certificate) shall use the standard format set out in Annex I to this Regulation. This format shall be used whenever a Part A Certificate is issued, renewed, updated, amended or revoked. Safety certificates issued in accordance with Article 10(2)(b) of Directive 2004/49/EC (Part B Certificate) shall use the standard format set out in Annex II to this Regulation. This format shall be used whenever a Part B Certificate is issued, renewed, updated, amended or revoked. Applications for Part A and/or Part B Certificates submitted in accordance with Articles 10 and 12 of Directive 2004/49/EC shall be in the standard format set out in Annex III to this Regulation. The application form shall be filled out according to the guidelines described in Annex III to this Regulation. Each Safety Certificate shall be given a unique number, in accordance with the protocol described in Annex IV of this Regulation. The safety authority shall inform the Agency of the issue, renewal, amendment or revocation of all Part A and Part B safety certificates issued in accordance with Article 10(2) of Directive 2004/49/EC. All safety certificates issued in accordance with Directive 2001/14/EC shall be replaced with safety certificates to be delivered in accordance with Directive 2004/49/EC and this Regulation, at the latest by 1st January 2011. The amendment, updating or renewal of a safety certificate issued under Directive 2001/14/EC shall be done in accordance with the present Regulation and Directive 2004/49/EC. Any railway undertaking which already holds a safety certificate granted under Directive 2001/14/EC has the right to request a new safety certificate issued in accordance with this Regulation and Directive 2004/49/EC from the national safety authority. Done at Brussels, 13 June 2007. (1) OJ L 164, 30.4.2004, p. 44, as corrected by OJ L 220, 21.6.2004, p. 16. (2) OJ L 164, 30.4.2004, p. 1, as corrected by OJ L 220, 21.6.2004, p. 3. (3) OJ L 235, 17.9.1996, p. 6. Directive as last amended by Directive 2004/50/EC of the European Parliament and of the Council (OJ L 164, 30.4.2004, p. 114, as corrected by OJ L 220, 21.6.2004, p. 40). (4) OJ L 110, 20.4.2001, p. 1. Directive as amended by Directive 2004/50/EC. (5) OJ L 75, 15.3.2001, p. 29. Directive as last amended by Directive 2004/49/EC. 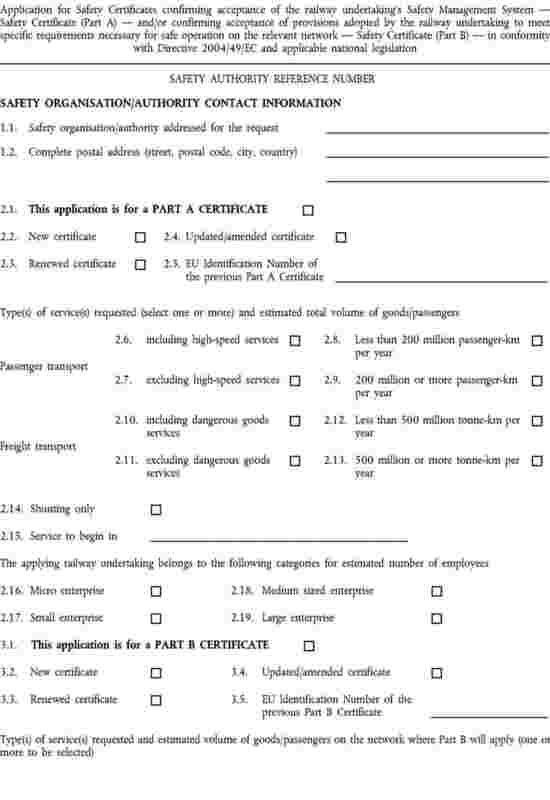 This Application Form is to be used by railway undertakings (also referred to as ‘the applicant’) applying for a Safety Certificate Part A and/or Part B (Article 10(1) — Directive 2004/49/EC). References in this document are made, unless otherwise mentioned, to Articles in Directive 2004/49/EC. A railway undertaking applying for either one of these certificates or for both may use this Application Form to forward its request to the competent issuing safety authority/organisation. Its use will enable the authority to process the request without undue delay and however within the terms fixed in Article 12(1). All fields in the form should be completed and applicable information provided by the railway undertaking. This document allows a railway undertaking to apply, at the same time, both for Part A and Part B Certificates or just for one of them using the same form; it can be used to request either a new, renewed or updated/amended Part A and/or Part B Certificate (as defined in Article 10(5)). It is possible to apply only for a new Part A Certificate and, with a second application, later for the first Part B Certificate. If applying only for a Part B Certificate, it is necessary to hold a valid Part A Certificate. According to Article 10(5), a Safety Certificate shall be wholly or partly updated whenever the type or extent of the operation is substantially altered and the holder shall without delay inform the competent safety authority of all major changes in the conditions of the relevant part of the Safety Certificate. Therefore it is important, for the safety authority to know and for the railway undertaking to establish ‘type’ and ‘extent’ of railway services. ‘Type’ and ‘extent’, form the basis for the Community validity of the Part A Certificate and provide reference to define ‘equivalent rail transport operations’ (Article 10(3)) throughout the Community. ‘Type’ of service is characterised by passenger transport, including and excluding high-speed services, freight transport, including and excluding dangerous goods services, and shunting services only. ‘Extent’ of service and of the railway undertaking is characterised by volume of passenger/goods and the estimated size of the railway undertaking in terms of employees working in the railway sector (micro, small, medium sized, large enterprise). ‘Type’ and ‘extent’ of services for all Part B Certificates, carried out globally by the same railway undertaking in one or more States, must be covered by ‘type’ and ‘extent’ of services of the Part A Certificate. 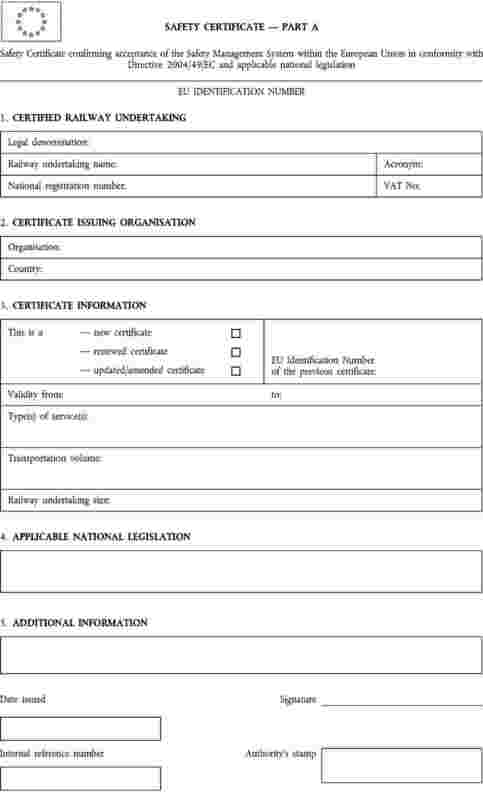 All information contained in fields 2.6 to 2.19 and 3.6 to 3.16 is necessary to establish if services intended to be operated with the requested Safety Certificate are equivalent or not to other rail transport operations already carried out by the applicant under previously held valid certificate(s). 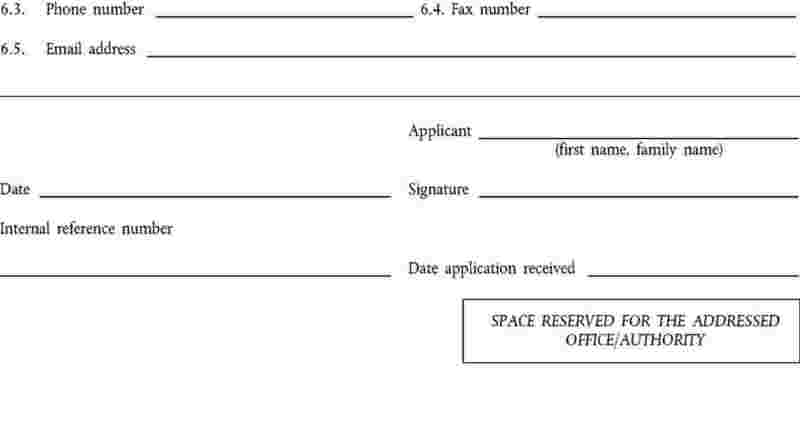 Page 3 of the Application Form is intended as a reminder of the documents that must accompany each application. It shall be used as a reference list both for the applicant and for the issuing organisation/authority and therefore be used as the front page of the annexes to the application form (each box must be checked according to the specific cases). For easy reference and guidance, each field in the Application Form has been numbered and explained in the following pages. A person authorised to approve the request submitted with the Application Form shall sign the document, in the appropriate space, delivered to the safety organisation/authority. The name of the signing person shall also be spelled out. Name and address of the safety authority/organisation to which the application is being sent. Updated information may be found, by other means, also by checking the European Railway Agency website (www.era.eu.int) or the website of the issuing Safety Organisation/Authority (if applicable). 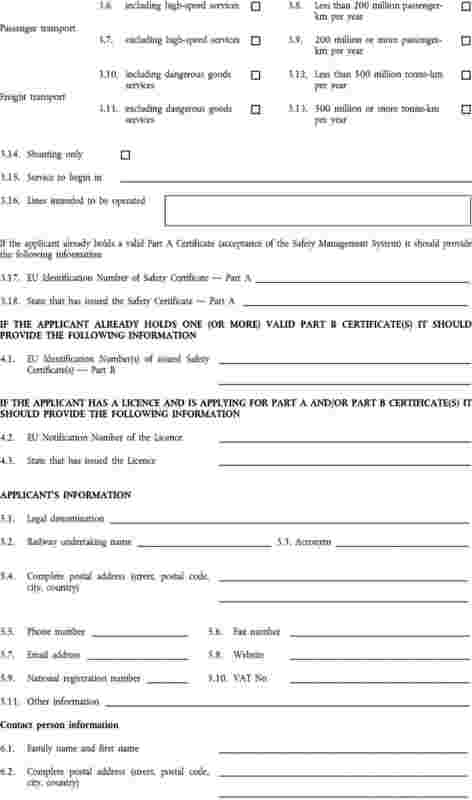 This field is to specify if the Application Form submitted is for a Safety Certificate Part A. In this case additional information must be provided, selecting the following tick-boxes, to identify type and extent of the railway undertaking's services. in any other case not covered by the following fields 2.3 and 2.4. A Safety Certificate shall be renewed upon application by the railway undertaking at intervals not exceeding five years (Article 10(5)). Whenever the type or extent of the operation of a railway undertaking is substantially altered, a Safety Certificate shall be wholly or partly updated and it is therefore necessary to request an updated/amended certificate; in addition, the holder of the Safety Certificate shall without delay inform the competent authority of all major changes in the conditions of the relevant part of the Safety Certificate and whenever new categories of staff or new types of rolling stock are introduced (Article 10(5)). If applicable, specify the complete EU Identification Number of the previous Part A Certificate in relation to which the Application Form is being submitted to the safety authority/organisation addressed in fields 1.1 and 1.2. When applying also/only for passenger services, it has to be specified, by ticking the appropriate box, if the operations will include or exclude high-speed services: only one option may be selected. However, services referred to the selected option 2.6 or 2.7, are also comprehensive of any other type of passenger transport (i.e. regional, short, medium, long distance etc.) as well as of any other service necessary to carry out the passenger services applying for (shunting operations, etc.). For definitions of high-speed services, it is referred to Annex I of Directive 96/48/EC. When applying for passenger services 2.6 or 2.7, it has to be specified, by ticking the appropriate box, the estimated current or planned volume, in terms of passenger-km per year, of the services. Only one option may be selected. The categories considered are compliant and in accordance with Regulation (EC) No 1192/2003 on rail transport statistics. When applying also/only for freight services, it has to be specified, by ticking the appropriate box, if the operations will include or exclude transport of dangerous goods: only one option may be selected. However, services referred to the selected option 2.10 or 2.11, are also comprehensive of any other type of freight transport not explicitly mentioned as well as of any other service necessary to carry out the freight services applying for (shunting operations, etc.). For definitions relating to dangerous goods, it is referred to Directive 96/49/EC and its annexes. Operators carrying out rail transport services for internal railway needs are deemed to be within the scope of the freight category (e.g. track maintenance companies transferring working machines from one site to another or companies operating measurement trains). When applying for freight services 2.10 or 2.11, it has to be specified, by ticking the appropriate box, the estimate current or planned volume, in terms of tonne-km per year, of the services. Only one option may be selected. The categories considered are compliant and in accordance with Regulation (EC) No 1192/2003 on rail transport statistics. If the applicant intends to carry out only shunting services without performing passenger or freight transport, this box shall be selected. Referring to the services applied for (passenger, freight, shunting only), the date on which operational service is intended to begin or, in case of a renewed or updated/amended certificate, the date on which the certificate is intended to become effective and replace the previous one has to be specified. If the number of employees working in the railway sector or involved in railway operations and related matters, including the contractors, is between 0 (thus providing only a job for the entrepreneur) and 9 occupied persons, then option ‘Micro enterprise’ has to be selected. The definition on the size of enterprises refers to that applied by the Directorate General for Enterprise and Industry. Only one option can be chosen among those available (2.16, 2.17, 2.18, 2.19). If the number of employees working in the railway sector or involved in railway operations and related matters, including the contractors, is between 10 and 49 occupied persons, then option ‘Small enterprise’ has to be selected. The definition on the size of enterprises refers to that applied by the Directorate General for Enterprise and Industry. Only one option can be chosen among those available (2.16, 2.17, 2.18, 2.19). If the number of employees working in the railway sector or involved in railway operations and related matters, including the contractors, is between 50 and 249 occupied persons, then option ‘Medium sized enterprise’ has to be selected. The definition on the size of enterprises refers to that applied by the Directorate General for Enterprise and Industry. Only one option can be chosen among those available (2.16, 2.17, 2.18, 2.19). If the number of employees working in the railway sector or involved in railway operations and related matters, including the contractors, is 250 or more occupied persons, then option ‘Large enterprise’ has to be selected. The definition on the size of enterprises refers to that applied by the Directorate General for Enterprise and Industry. Only one option can be chosen among those available (2.16, 2.17, 2.18, 2.19). 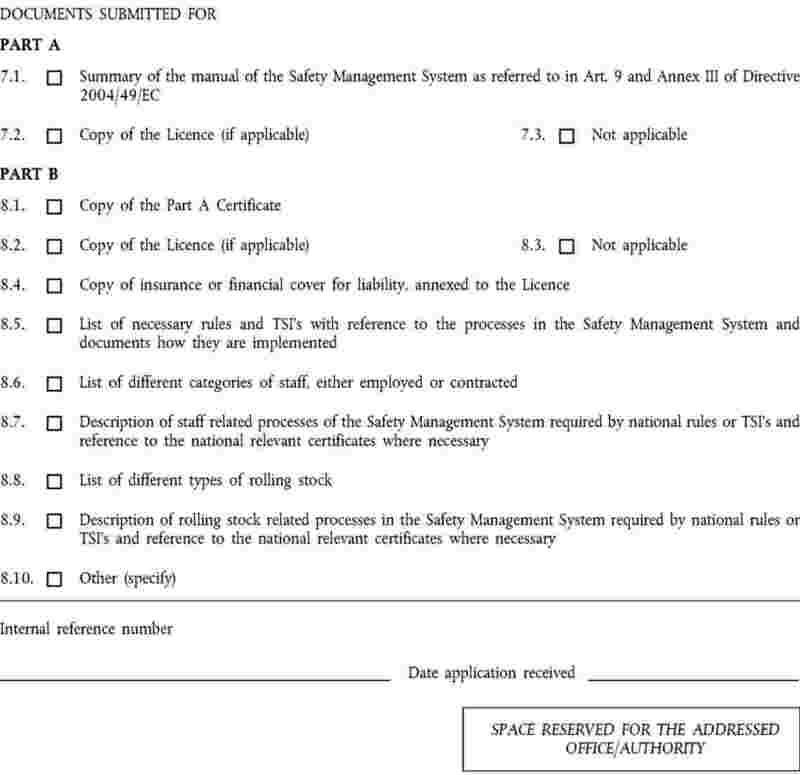 This field is to specify if the Application Form submitted is for a Safety Certificate Part B. In this case additional information must be provided, selecting the following tick-boxes, to identify type and extent of the railway undertaking's services. in any other case not covered by the following fields 3.3 and 3.4. If applicable, specify the complete EU Identification Number of the previous Part B Certificate in relation to which the Application Form is being submitted to the safety authority/organisation addressed in fields 1.1 and 1.2. Same as 2.6, 2.7 (see above). Same as 2.8, 2.9 (see above). Same as 2.10, 2.11 (see above). Same as 2.12, 2.13 (see above). Same as 2.14 (see above). Same as 2.15 (see above). A Safety Certificate Part B may cover the whole railway network of a Member State or only a defined part thereof (Article 10(1)), it is therefore necessary to specify clearly all the lines where services (passenger, freight or shunting only) are intended to be operated. The denomination/name of the lines are those given in the ‘Network Statement’ (refer to Article 3 and Annex I of Directive 2001/14/EC): railway undertakings must refer to the lines using these denominations/names. If the available space is not sufficient, the applicant shall provide annexes to the Application Form and use this field to specify them. This information is to be provided only if the applicant is applying for a new, renewed or updated/amended Safety Certificate Part B and already holds a valid Safety Certificate Part A. 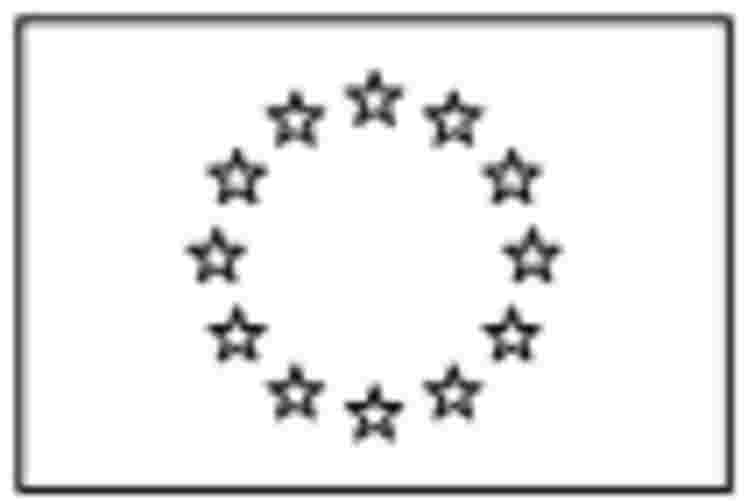 The EU Identification Number is given by each issuing authority/organisation on the basis of fixed rules, regarding the codification that will be made available through the European Railway Agency. The information provided here does not exempt the applicant from submitting a copy of the Safety Certificate Part A together with the application (8.1). If an EU Identification Number is still not available, write ‘NOT APPLICABLE’ in the box. Here the State has to be specified that issued the Safety Certificate Part A (i.e. the State which the issuing authority/organisation belongs to). The information provided here does not exempt the applicant from submitting a copy of the Safety Certificate Part A together with the application (8.1). This information is to be provided only in case the applicant holds one or more valid Safety Certificate(s) Part B. The EU Identification Number(s) of the already issued Part B Certificate(s) has(ve) to be specified, separating them with ‘/’ if the case applies. It is not necessary for the applicant to submit a copy of the Safety Certificate(s) Part B together with the application. This information is to be provided only if applying for either Part A and/or Part B in case the railway undertaking already has a valid Licence (Council Directive 95/18/EC as amended by Directive 2001/13/EC). The information provided does not exempt the applicant from submitting a copy of the Licence together with the application (7.2 and 8.2). NOTE: A railway undertaking, as defined in Directive 2001/14/EC, must be licensed according to applicable Community legislation, nevertheless a railway undertaking, as defined in Directive 2004/49/EC, is not always required to have a licence. Here the State has to be specified that issued the Licence (i.e. the State which the issuing authority/organisation belongs to). The information provided here does not exempt the applicant from submitting a copy of the Licence together with the application (7.2 and 8.2). If ‘Legal Denomination’ and ‘Railway undertaking name’ differ, then both shall be included. Each applicant shall provide the necessary information to allow the issuing body to contact the railway undertaking (telephone numbers should indicate the number to the switchboard, where applicable, and not to the person in charge of the certification process; telephone and fax numbers should include the country code; the e-mail address should refer to the general mail box of the railway undertaking). The railway undertaking contact information should indicate the general address avoiding references to a specific person as this information may be entered in points 6.1 to 6.5. Specification of the website (5.8) is not compulsory. If several registration numbers are attributed under national law to the applying railway undertaking, there are possibilities in the form to enter both the VAT number (5.10) and a second registration number (5.9) (e.g. trade register). Information, other than that clearly requested in the other fields, can be added if necessary. During all the certification process, the contact person is the interface between the railway undertaking submitting the request and the issuing organisation/authority. He/she provides support, assistance, information, clarifications, where necessary, and is the reference point for the issuing body dealing with the application. Telephone and fax numbers should include the country code; e-mail address is not compulsory. 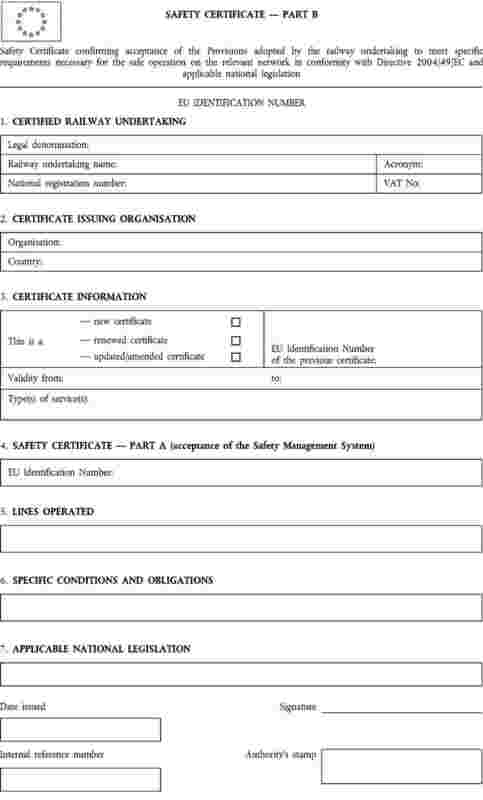 This document should be submitted if applying for a Safety Certificate Part A (new, renewed or updated/amended certificate); ‘Summary of the Safety Management System (SMS) manual’ is here intended as a document reviewing and underlining the main elements of the railway undertaking's SMS. It must detail and give supporting information and evidence of the different processes or company standards/rules implemented (or in the phase of implementation), cross referencing or linked to the items identified in Article 9 and Annex III. A railway undertaking, as defined in Directive 2001/14/EC, must be licensed according to applicable Community legislation; in Directive 2004/49/EC, however, a railway undertaking is defined as not being required to have a licence, therefore it must submit a copy of a valid licence only if the case applies. If it does not apply the option ‘Not applicable’ should be picked (7.3 and/or 8.3). If in this Application Form applying only for a Safety Certificate Part B (new, renewed or updated/amended certificate) but not also for a Safety Certificate Part A, then the copy of a valid Safety Certificate Part A should be submitted. Same as 7.2 (see above). Same as 7.3 (see above). According to Article 9 of Directive 95/18/EC a railway undertaking shall be adequately insured or make equivalent arrangements (e.g. a financial guarantee) for cover, in accordance with national and international law, of its liabilities in the event of accidents. The proof that a licensed railway undertaking complies with national requirements concerning insurance or has made equivalent arrangements for cover for its liabilities is annexed to the licence (Commission Recommendation 2004/358/EC). A copy of the insurance or financial cover for liability annexed to the licence must be submitted with the Application Form. The applicant shall list or submit documentation on the TSIs or parts of the TSIs and, where relevant, of the national safety rules and other rules applicable to staff, rolling stock and, in general, to the services intended to be operated with the requested certificate. Clear reference should be made to the processes and documents where the TSIs are applicable and implemented. To avoid duplication of work and to reduce the amount of information, only summary documentation should be submitted concerning elements that comply with TSIs and other requirements of Directives 96/48/EC and 2001/16/EC. The applicant shall submit a complete list of the different CATEGORIES OF STAFF employed or contracted for services intended to be operated with the requested certificate. The list of CATEGORIES OF STAFF shall comply with national and network specific rules that apply for their categorisation. The applicant shall submit a description or evidence of those processes within the Safety Management System that are related to STAFF, including evidence that they meet the requirements of the national rules and/or relevant TSIs and that the staff has been duly certified. The applicant shall submit a complete documentation on the different TYPES OF ROLLING STOCK intended to be operated with the requested certificate. The TYPES OF ROLLING STOCK shall comply with national and network specific rules that apply for their categorisation. The applicant shall submit a description or evidence of those processes within the Safety Management System that are related to ROLLING STOCK, including evidence that they meet requirements of the national rules and/or relevant TSIs and that the rolling stock has been duly certified. Available space to specify other documents submitted with the application. Please identify number and type, together with a short description of the content of the document. The country codes are those officially published and updated on the European website in the Interinstitutional style guide and are based on the standard ISO 3166 alpha-2. [1 2] for Safety Certificates — Part B. This field indicates the year (in the specified format yyyy, i.e. 4 digits) in which the certificate has been issued. The counter shall be a progressive number to be incremented by one unit each time a certificate is issued, regardless if it is a new, renewed or updated/amended certificate. Even in case a certificate is revoked, the number to which it refers cannot be used again. Every year the counter shall restart from zero.